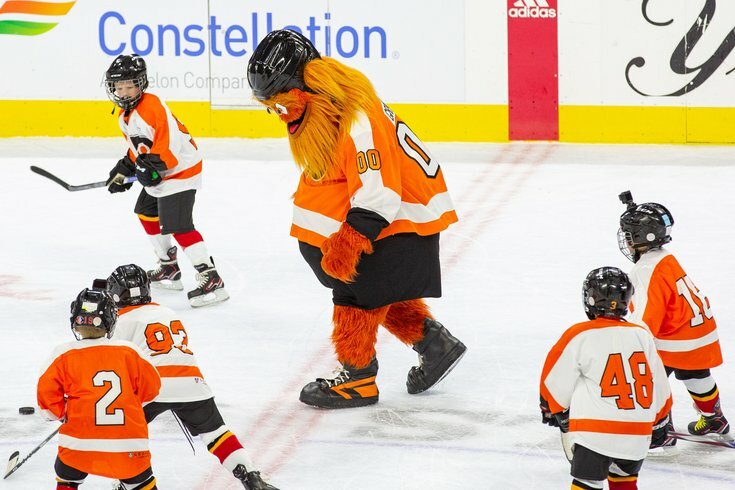 Philadelphia Flyers mascot Gritty scrimmages with the Mites on Ice during a game at the Wells Fargo Center, Nov. 8, 2018. The Delaware County Government Center was closed for most business last Monday. The music and solemn revelry echoing over the courthouse and into the courtyard explained why: it was Veterans Day. The second-floor County Council meeting room, though, was abuzz with activity. More than a dozen witnesses watched Election Board workers conduct a ballot-by-ballot read-through of votes cast in the 168th U.S. House district election that Republican incumbent Christopher Quinn won, defeating Democratic challenger Kristin Seale by fewer than 800 votes. That mechanical failure delayed Delco's write-in vote count which, in retrospect, was for the best. After all, denizens of that bizarre swath of the world failed to do what many thought they would: show even a lick of support for Gritty, the Flyers mascot closely aligned with Delco's je ne sais quoi. As it is wont to be, Delco remained an outlier in this regard during the 2018 general election, as write-in votes for the Flyers new mascot poured in from across the region. In all, at least 75 votes total were cast for Gritty in Bucks, Chester, Montgomery and Philadelphia counties in Pennsylvania and Camden and Gloucester counties in New Jersey. Burlington declined to provide any information despite repeated requests. Leading the way, obviously, was Philadelphia County, which cast 43 Gritty votes. Let's take a look at a county-by-county breakdown, shall we? A visual representation of where Gritty got, and did not get, write-in votes in the November 2018 general election across the Delaware Valley. PHILADELPHIA: With 43 votes spread across the city, these write-ins warranted a separate story of their own last week. You can read about the neighborhoods from where they came, and the offices for which Gritty was eyed, via this link. As far as Gritty's concerned, 4 voters wrote him in for elected office. Two of those votes were for governor and one for each U.S. Senate and the Sixth District state senate seat. Bucks voters also used the opportunity to speak truth to power insofar as the scourge of chemtrails in the skies above. There was a vote for "Stop Chemtrails" to represent Pennsylvania in the U.S. Senate and in the Governor's mansion, "Chemtrails Poison" in the Sixth state senate race. "Chemtrails Kill" also got a vote in lieu of Gov. Tom Wolf. It also seems as if two gun enthusiasts wanted the "2nd Amendment" to represent him or her in Congress while another one thought that non-human entity would best represent the 143rd Legislative District. "Unlike many other counties in the Commonwealth, Chester County has paper hand-marked ballots. With over 237,000 paper ballots cast, we must first focus on certifying our winners for the election," explained Kara C. Rahn, the newly appointed deputy county administrator who served as director of the county Department of Voter Services through the most recent election. "Normally, we do not review each and every write-in vote name written when the overwhelming number of votes were for candidates on the ballot itself," she continued. "When we certify these to the department of state, they are considered 'scattered' with no specificity required." DELAWARE: When Gritty's origin story of having emerged from underneath the Wells Fargo Center to join us on the surface was first reported, there were some people who weren't entirely having it. Delco, went their thinking, is really where from where he came. It was a stance that made sense, as Gritty has more than just a little Delco sensibility going on behind those crazy eyes. When Adrienne Marofsky, Delaware County's director of public relations, sent a PDF of write-in votes cast on machines during the November 6 election, I couldn't wait to see just how many of the 272 votes involved Gritty. "No King But Christ" got three (U.S. senator, governor/lieutenant governor and Fifth District U.S. Congress). Dolph Ziggler, who is apparently a professional wrestler, also tallied a trio of write-in votes (Fifth District U.S. Congress, 26th District State Senate and 163rd District State House). Even rapper Li'l Kim got one for in that Fifth District U.S. Congress race. Nowhere on that list, however, did Gritty's name appear. That's right: at this point, Gritty received zero votes in Delco. This is the shock of shocks for the Delaware Valley write-in vote roundup. Things may change, though. "We will add absentee and provisional write-ins next. It is still unofficial," Marofsky said on Friday. MONTGOMERY: After an open-records request that took just 16 minutes to honor, county officials provided a spreadsheet of the 877 write-in votes cast across Montco. Of those, 10 votes were for Gritty. The positions: U.S. senator, governor/lieutenant governor, two for U.S. House (4th District), state senator (District 12) and state representative races in the 148th (three votes), 149th and 152nd districts. BURLINGTON: At least a half dozen requests for public information regarding write-in votes in general went unreturned during the time since Election Day. Don't come looking for help when Gritty shows up at the county borders seeking answers. CAMDEN: Gritty got 14 write-in votes in the county that sits right on the other side of the Walt Whitman and Ben Franklin Bridges. They break down as such: First District U.S. Rep. (2 votes), county sheriff (2 votes) and boards of education positions in Audubon, Cherry Hill, Clementon (2 votes), Collingswood (2 votes) and my hometown of Haddon Township, with an extraordinary four-vote push. GLOUCESTER: County Superintendent of Elections Stephanie Salvatore noted that “college kids like to have fun with the write-in names” and this year was no different. While Swoop and the Phillie Phanatic both garnered support near Rowan University, Gritty culled 4 votes overall, with three in Glassboro and the fourth from Deptford.